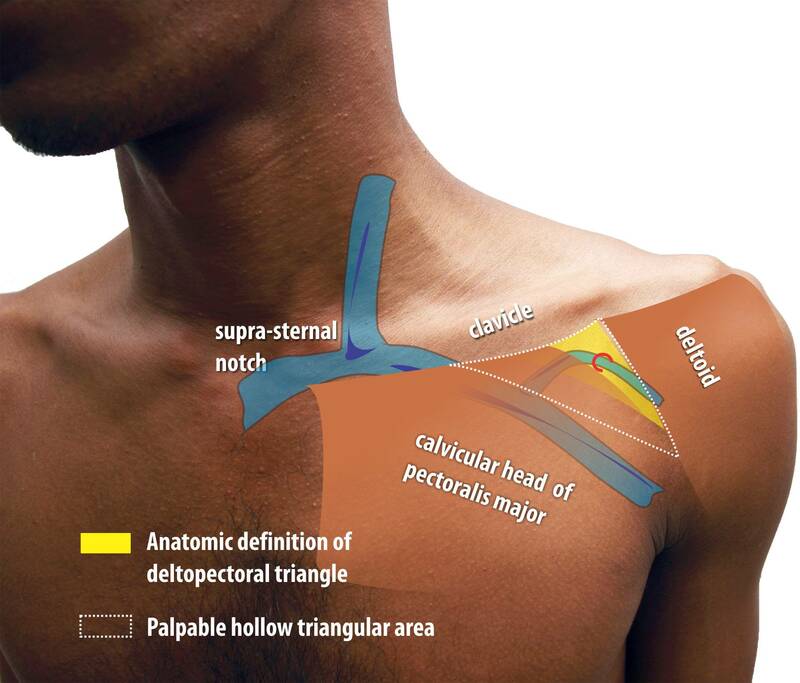 The deltopectoral triangle is a triangular depression formed between the clavicle above, lateral border of the pectoralis major medially and the medial border of the deltoid laterally. This narrow triangular area contains investing layers of the clavipectoral fascia and the cephalic vein on its roof which it pierces. The investing layers of the clavipectoral fascia extend laterally along the vein and artery to blend with the axillary fascia. The axillary vein which is the vein segment between the subclavian and the brachial vein is an extra-thoracic structure which lies deep to the pectroralis major muscle and is a component of the anterior wall of the axilla. The upper limb drains to the central venous system by means of axillary vein which becomes the subclavian vein as it travels above the first rib towards the thoracic inlet. The subclavian vein lies anterior to the artery on the anterior aspect of the first rib when it crosses over it. medial to the first rib, the vein is considered an intra-thoracic structure. 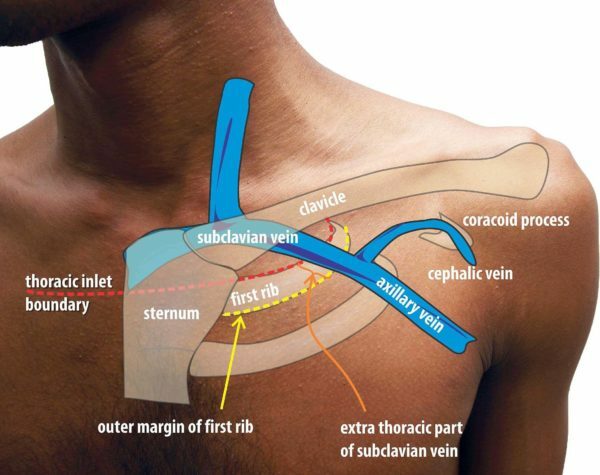 Figure : The axillary vein becomes the subclavian vein after traveling medially over the first rib. It lies two finger breadths below the coracoid process tip but this is a difficult structure to palpate unless the patient is thin. The vein component which overlies the first rib (i.e. 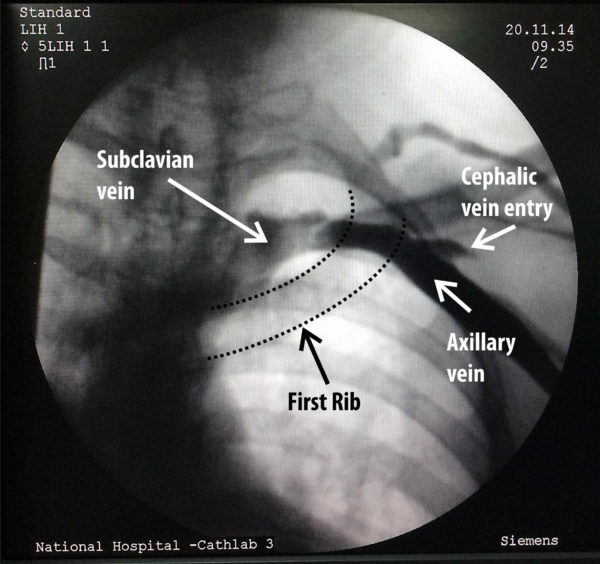 between the medial and lateral border of the rib shaft) is termed the “extrathoracic component of the subclaivan vein”. This is the target for accessing the vein using fluroscopic techniques. For punctured access (seldinger technique), the needle is either entered through the medial aspect of the delto- pectoral triangle (subclavian access) or from the lateral edge of the triangle (extra-thoracic subclavian or axillary vein access). The subclavian vein arches over the anterior aspect of the pleural dome while lying directly behind the medial 1/4 of the clavicle. This portion of the vein is relatively constant but accessing has more risk of a pneumothorax in view of close proximity to the lung apex. Furthermore, inserting a pacemaker lead in this segment carries the risk of lead crush from the the subclavius muscle / first rib as they lie very close. The tip of the coracoid process can be felt deep within the lateral part of the deltopectoral triangle.The axillary vein is said to lie deep to the pectoral is major muscle at a point two finger breadths below the tip of the coracoid process. However this is difficult to palpate in most people unless they are very thin. Pacemaker implantation is done in fasting state and therefore depending on the circumstances, the patient might be significantly dehydrated. Veins collapse in dehydrated patients and makes access difficult – hence if the patient is fasting for an excessive amount of time or if there are clinical features suggestive of dehydration (e.g. collapsed peripheral or neck veins) – it would be prudent to re-hydrate intravenously before the procedure. Video : Ensure that the needle is not tightly attached to the syringe as if you struggle to remove the syringe when the needle has entered the vein, you may lose access. The syringe should be a 5 ml or 10 ml syringe with about 2 ml of flush. Large syringes make too much suction and attract fat and other debris into the needle which can obstruct its lumen. Its usually available for the first time only – i.e. for a future new lead (e.g. upgrade) – the vein is not available because of fibrosis. It may make a future lead extraction difficult. The most important drawback is that it de-skills the operator on punctured access – which is a valuable skill to have when dealing with a difficult cut-down or when faced with lead revision / upgrade. The fear of punctured access – creating a pneumothorax is a mostly avoidable complication if one pays attention to anatomy & sound technique – thus rendering cutdowns obsolete. There is a higher risk (1%) of pneumothorax. The extra-thoracic subclavian or axillary vein approach reduces the risk of pneumothorax but is technically challenging as the axillary vein has a more variable course compared to the stable subclavian vein (although this vein diameter may be larger than the subclavian as less surrounding tissue compression) . There is no issue of lead crush and this is the technique of choice when using large leads such as ICD leads or when multiple leads are used (e.g. in CRT) Both techniques are described in detail in the subsequent sections.